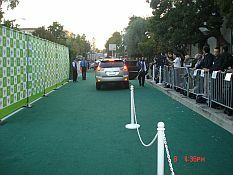 On November 8, 2006, Chuck's Parking Service provided valet parking for 1,200 presenters, celebrities, and guests for the 16th Annual Environmental Media Awards at the Wilshire Ebell Theater. The valet drop off area included a general valet area as well as a specially designed "Green Carpet" lane that was exclusively for the valet drop off of hybrid vehicles. The lane was designed, coordinated, and operated by Chuck's Parking Service. It also included a temporary street and sidewalk closure as well as City of Los Angeles Traffic Officer.